The United States Golf Teachers Federation is pleased to announce the following company affiliations. These member benefits are for USGTF members’ personal use only. Only USGTF members in good standing are eligible to receive these benefits. To redeem benefits, please contact the USGTF National Office 1-888-346-3290. Mizuno Golf — Members receive 15% below wholesale cost on all Mizuno Golf products. Callaway — Members receive discounts on all Callaway Golf products (discount varies by level of certification). Nike Golf — Members receive 25% below wholesale on all Nike Golf products. Bridgestone Golf — Members receive 10% below wholesale on Bridgestone Golf clubs and bags and 25% below wholesale on balls and accessories. TaylorMade Golf— Members receive wholesale pricing on all TaylorMade Golf products. Adidas Golf — Members receive 10% below wholesale on all Adidas Golf products. Cleveland Golf — Members receive 5% below wholesale on all Cleveland Golf products. Srixon Golf Balls — Members receive 5% below wholesale on all Srixon Golf balls. Wilson— Member receive discounts between 20% – 50% below wholesale on all Wilson Golf products. Tour Edge — Members receive 22% below wholesale cost on all TourEdge products. Yonex Golf — Members receive up to 35% below wholesale on all Yonex Golf products. Cobra — Members receive 20% below wholesale on all Cobra Golf products. Liability Insurance – Bollinger through Insurance Office of America offers USGTF members affordable liability insurance policies. Prescription Discount Card – Provides you Savings up to 75% off the retail prices on everyday drugs and is accepted at all major chains and independent pharmacies nationwide. Print your Free USGTF RX Card here. Rudy Project USA – USGTF members receive 52.5% discount on orders, including Rudy Project’s golf line and single vision Rx orders. Volvik Golf Balls — Members receive up to 20% below wholesale on Volvik Golf products. Golf Around the World (a training aids company) — Members receive wholesale pricing on all products. Bolle & Serengeti Optics. — Members receive wholesale pricing on all products. Bushnell—Member receive various discounts on all Bushnell products. Budget Rent A Car —Budget offers USGTF members and friends great savings and offers any time they travel – anywhere! Simply use the USGTF special BCD (Budget Customer Discount) number when making your reservation. Avis Rent A Car — Avis offers USGTF members and friends special discounts – no matter where or when you travel! Just use the special USGTF AWD (Avis Worldwide Discount) number when reserving your rental. Worldwide WGTF recognition – Personalized WGTF membership cards now available. Please contact Jennifer Russakis in Membership Services at 1-888-346-3290 or info@usgtf.com for more information. 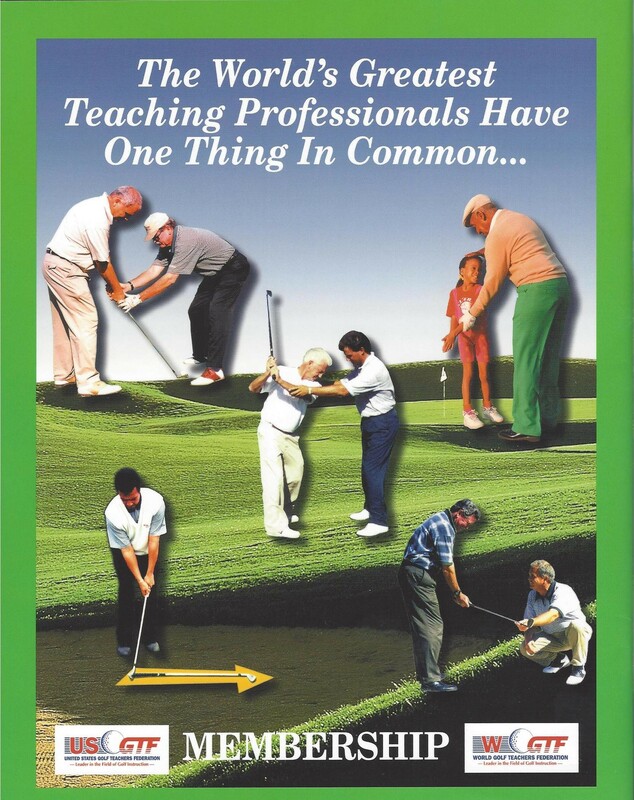 Golf Teaching Pro Magazine — The international publication of the USGTF. This publication keeps golf teaching professionals throughout the world informed on the latest up-to-date teaching methodology, member benefits, tournament information and ongoing education. American Golf Teaching Method Manual – The official instructional publication of the United States Golf Teachers Federation. The USGTF provides a full color illustrated instructional book that is easy to read and filled with instructional photos. It is the most complete publication for those entering the golf teaching industry. Available to purchase in the USGTF Pro Shop. Monthly Newsletter – www.USGTFNewsletter.com is a news site designed to help keep all members up-to-date on current USGTF and worldwide events. World Golf Teachers Cup® This biennial event features four days of competition with teaching professionals from all WGTF member nation federations. www.WorldGolfTeachersCup.com. USGTF Members Board – A website geared specifically for USGTF and WGTF members. www.USGTFMembers.com is yet another amenity offered by the USGTF for the benefit of its members. Categories include General Information, Member News, and Teacher Talk. USGTF Pro Shop —USGTF and WGTF logoed merchandise, training aids, self-help books and videos on marketing and management skills and more. www.USGTFProShop.com. International PGA affiliation – The USGTF is endorsed and promoted by the International PGA, www.InternationalPGA.com.